In Part 1, we analyzed our requirements and the tools at our disposal to get an initial application design. 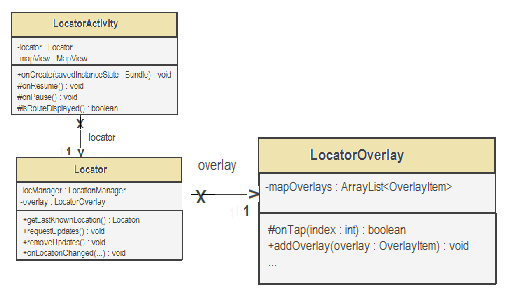 This part will start the implementation with the lower-level class, LocatorOverlay, and answer the following question: What feature(s) do we want to provide on top of the phone's location map? 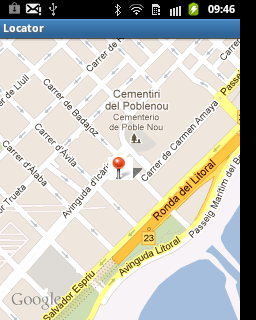 Simply displaying a map location on a phone screen is cute...for about ten seconds. So we need to think about added functionality. Here, we'll implement a "send location to contact" feature: the user can just tap on his/her phone's location point on the map, and share it with any number of contacts via SMS. The ItemizedOverlay subclass of Overlay, which we can use as a list of overlay items. 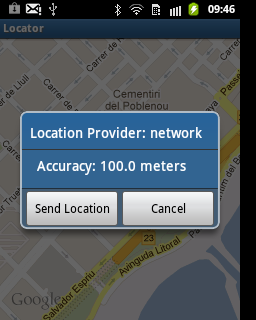 The MyLocationOverlay subclass of Overlay, that draws the user location on a map. // get location in the format "latitude,longitude"
Of course, nothing prevents us from sending both a location URL and a street address to the SMS recipient. Be aware though that in general the reverse-geocoding lookup will slow down the application response time in a noticeable way, and in this case, the time needed for the dialog to pop-up in response to the tap event. We're done with LocatorOverlay. In Part 3, we'll implement the Locator class.